Fire and safety education is one of the core services offered at Integral Fire Protection. As specialists in the industry, we are committed to educating our clients on all aspects of fire safety. Our goal is to ensure that all of our clients are equipped with the correct knowledge and shared understanding of the importance of fire safety and how to handle a fire hazard if the situation arises. For free information on how you can protect your family and friends from fire dangers, contact us here or via the link below. Click the image on the left to open a large chart in JPEG format. 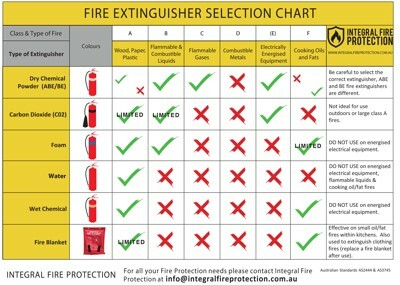 We are also happy to offer our valued clients a FREE Fire Extinguisher selection chart, suitable for your home or office. Our charts are specially designed to educate you on the types of fire extinguishers that can be used on varying fire classes. At Integral Fire Protection, safety is our passion and your safety is our priority! Download a full size Fire Extinguisher Chart in PDF format.